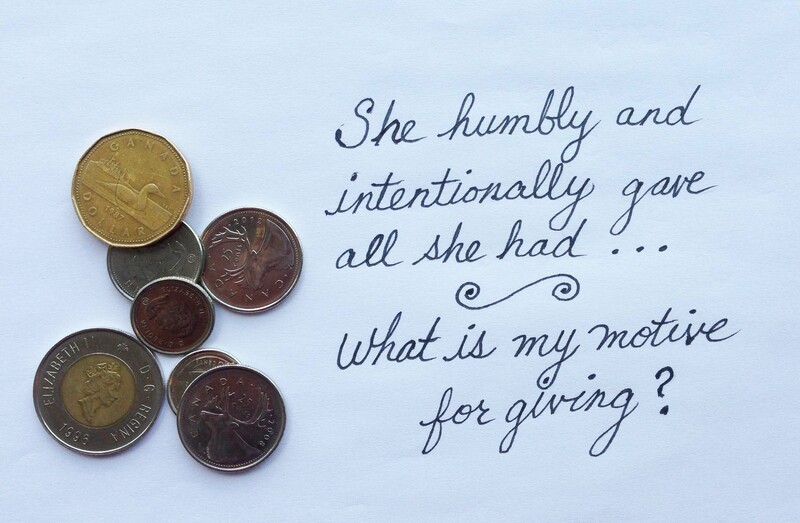 As I read her shaky, thoughtful handwriting, I could not help but think of how Jesus took notice of the widow who gave her two small coins (LUKE 21:1-4). Her act of worship was extravagant! She humbly and intentionally gave all she had—compared to the gifts of larger amounts just “tossed” into the offering box by those who still had plenty to spare. Both of these women inspire me to reflect on my giving practices. Do I give sacrificially? Or do I give after all my needs and wants have been satisfied? What is my motive for giving? Am I willing to give in such a way that means I live with less? The other thought that strikes me is that Jesus notices our gifts! This leads me to ask myself, “What Jesus would say about my giving patterns? Would he be pleased?” For that is what really matters! 1. What does LUKE 21:1-4 say about justice and compassion? 2. What does it mean for the church and for followers of Christ today? How can I apply this in my own life this very day?